Are you looking for Halloween costume ideas for a family with baby? Maybe you’re trying to help your best friend out, or maybe you’re the one with a baby in the family. Whatever your reason, let us assure you that you don’t have to look for costumes anywhere else now that you’ve found us! Why? It’s because we’re doing the “looking” for you. So just sit back, relax and enjoy our show! In other words, scroll through, read, and relish our top choices. Then pick the ones that best fit your family’s style and personality. This should be a fun experience, right?! Of course, it is! You are looking for Halloween costume ideas for family with baby and the holiday is such an exciting time of the year! Matching Halloween costumes for mom, dad, and baby are trendy these days. As parents, you can be superman and wonder woman, and baby could be the newest superhero addition to the family! Yeah, these two characters have never had a baby together. However, nothing is impossible in fantasies – so why not, eh? God bless the little grandparents! You know what would be cute and adorable? Dressing up your pumpkins as miniature grandparents and yourselves as the babies! Real grannies will have a hoot seeing these Halloween costume ideas for family with baby turn to reality! On a budget? Don’t cry, you can always DIY! An example of a unique and easy DIY Halloween costume would be (drum rolls please) – WASH DAY ESSENTIALS! Other people call it “the laundry.” But for us “wash day essentials” seems way cooler. Anyway, we’re pretty sure you’ve got some laundry stuff at home and some cardboard boxes. Just put them all together and you’ll get this hilarious ensemble! Don’t forget the dirty clothes to be put in the washing machine! If this idea isn’t your thing, there are plenty of other DIY ideas too, and many of them can be found on Pinterest! If you’re a family of 4 with a baby or two, go trick-or-treating as characters from Sesame Street! The costumes are adorable, and the colors are bright and fantastic! This set will make you the most endearing Sesame Street bunch there ever will be! We all know who Waldo is. But did you know that he has a family, too?! Yup, you heard us right. He has a family, and if you’re a family of 3 with a baby as your third member, Mr. and Mrs. Waldo would be perfect costumes for you! Your little boy or girl could be Baby Waldo (naturally!). Plus, you could wear the sweaters again during Christmas to maximize their potential! They look so Christmassy in the first place! These kinds of Halloween costume ideas make us really excited because we get to recycle some of the items. When we recycle, we save money! And who doesn’t love saving money?! Nothing beats life at the farm! There are plenty of ideas for family Halloween costumes with baby’s costume as the main highlight! But a favorite that all of us at BabyCare Mag have is that of farm life! The contrast between the little farmers and the big hen and a proportionally larger egg is ironic (but endearing!). So adorable! Make the mother of dragons proud! Television shows are good sources of Halloween costume ideas. For instance, Game of Thrones themed costumes for Mom, Dad, and baby sell like crazy, particularly the dragon costumes! Parents seem to want to dress up their children as dragons while they dress up as Khaleesi and Khal Drogo. If you are planning on doing the same thing, then you’d better act fast because shops will probably run out of these costumes soon. But don’t worry, if you can’t find them in stores, you could order them online! Put on some literary gems! You can also choose to match Halloween costumes for toddler and baby if you have a small child and a baby at home! For instance, if you feel like you want to go literary, you can dress up your toddler as Little Red Riding Hood and the younger child as The Big Bad Wolf. Come to think of it, no one will ever be afraid of such a sweet looking wolf! We also recommend that you spend Halloween as characters from Alice in Wonderland. Why? Just look at the costumes. They’re perfect! Scare the wits out of everyone! There’s nothing wrong with wanting to be the stereotypical Halloween monsters. Don’t be afraid. Just follow your heart! You could be witches, vampires, monsters or ghouls! You could be anything as long as you take the role to heart. Be sure to apply your make up realistically to make it more fun! Speaking of monsters, if you really want to represent monsters, go classic. Dress as The Addams Family or the Munsters. They are the epitome of classic monsters. We think you could probably remember The Addams Family. After all, it was remade into a movie with Christina Ricci as Wednesday Addams. But we think that you might not remember the Munsters. You might not even be aware of it! Even so, we can assure you that it was such an awesome show! And that’s awesome with a capital A! Your baby could be Little Eddie! So there you have it – our list of ten amazing costumes! We could go on and on about all the stuff we were able to dig up from the depths of the internet. Some were a little bit on the mediocre side, but there were plenty that were unique. Unfortunately, we do not have all the space in this cyber world (and well, we want to go costume hunting too!). So, we just have to leave you with our ten picks! Well, what do you think?! Did you love them? 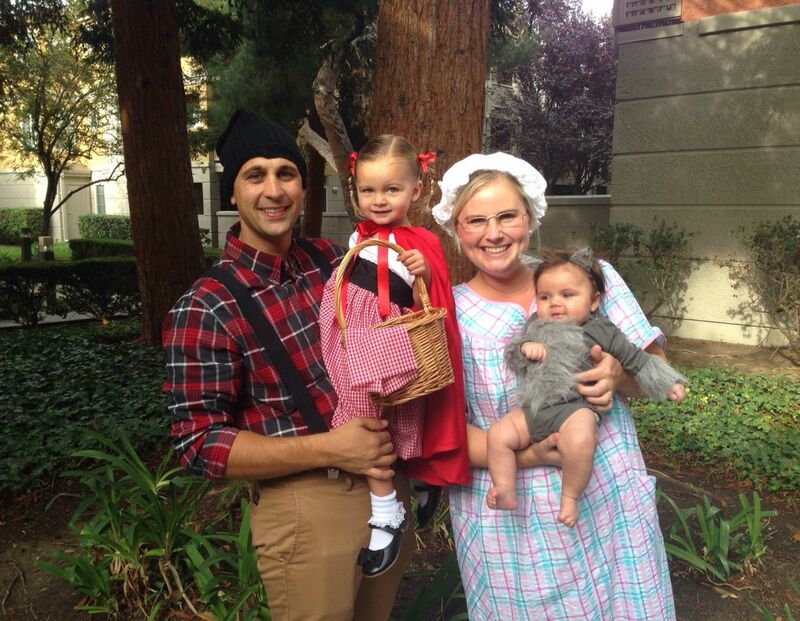 Leave us a comment and tell us which of the Halloween costume ideas for a family with baby you liked best!